Zac Efron and Orson Welles: if ever there was a more unlikely combination, for the life of me I cannot conjure it. Yet here they are in Richard Linklater’s “Me and Orson Welles,” a film whose sentimentally simplistic title indicates its own merits and demerits. And there are plenty of both. 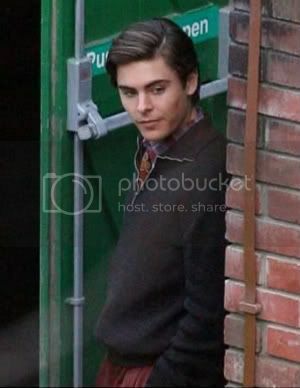 Efron plays Richard Samuels, a kid who skips school, takes the train into New York City with big dreams of acting stardom. Standing outside the Mercury Theatre in 1937, he gumptions himself into the role of Lucius in “Julius Caesar,” a play written by Shakespeare and directed by Orson Welles (just try to imagine a creative dispute between those two). Welles takes a shine to Richard, and Richard takes a different kind of shine to the play’s Production Assistant, Sonja Jones, played by Claire Danes. The movie proceeds in many ways that we expect, the Mercury Theatre as the setting for much of the action. There are disputes in rehearsal, there is a supporting cast of actors playing actors, each with a small crisis specific to their role in the play, and we see the growing attraction between Richard and Sonja. These points may be standard, but they are never boring. Very much like Linklater’s “School of Rock,” this is a movie that is nearly impossible to dislike. The plot may be a little simple, but the subject matter is consistently engaging. None moreso than Christian McKay as Orson Welles. I will be surprised and disappointed if this film does not earn him an Oscar nomination. He looks like Welles; he moves like him; most importantly, he sounds like him – in voice and inflection and cadence. This is not impersonation, it is embodiment. Though the film is seen through Richard’s eyes, Welles propels the story along, and the film regards him mostly objectively. Yes, he can be a monster. But he is a genius. More than that, he is a charming genius, and McKay’s performance moves past all our defenses, so that when Welles is taking Richard under his wing, when they are dashing into cars to go to a radio play, we feel like we’ve been granted assembly with a god. As a serious actor, Zac Efron has a long way to go. My cynical assumption is that his attachment to the film allowed it a larger budget and (the producers surely are praying) a wider audience. And it is a wide-audience film, there’s nothing wrong with that. But does Efron has the dramatic range? No. He is stiff. He still operates on a dial set a little too much for Disney movies. Earlier this year, he showed he had adequate comic timing in the otherwise forgettable “17 Again,” and I will give him the benefit of the doubt and hope that he wanted the part to challenge himself as an actor. Indeed, the scenes between Efron and McKay are the best in the film, particularly a scene late in the story set on a park bench. Perhaps Efron is elevated by the brilliance of his scene partner, and while he is clearly upstaged by McKay’s Welles (how could he not be? ), they do prove Efron has the potential to be very good. The love story between his Richard and Claire Danes’ Sonja is interesting and appropriately messy, and Danes proves once again that she is a strong actress with an eye for interesting projects. The screenplay by first-time writer Holly Gent Palmo is too formulaic to be outright brilliant, and the same goes for Linklater’s direction. It seems non-existent. Where was the inventiveness he brought to his weird creations like “Waking Life” and “A Scanner Darkly”? Where were the long, luxurious shots he was so fond of in “Before Sunrise”? He has never been a favorite of mine, partly because he seems less devoted to his more accessible films. With some script-tweaking and a strong stylistic choice, this could have been a dynamic piece of filmmaking. Christian McKay certainly pulled out all the stops. What the movie is, though, is good and enjoyable. It presents a few hard-earned lessons, a brilliant performance, and it lets us imagine the rehearsals for a groundbreaking theatrical production. Well so I guess that’s no small feat itself, now is it? Jason Eaken is on Twitter at http://twitter.com/EAKEN. I’ll probably see this. Nice review! I probably won’t see this because of Efron. I didn’t expect to catch this, but I may give it a try.